Thanks to Beam Reach alumnus Celia Barroso for posting a link on our Facebook wall to a great new video featuring Val entitled “Science on the SPOT: Sound Waves – Listening to Orcas.” Check out Val’s great poise and excellent quotes in this piece by Ethan Morris! In a related piece, Cathy Britt created an educational slideshow called “Into the Waves with Orcas.” It has a bunch of great graphics and photographs which convey some basic acoustics, the sounds commonly made by killer whales, and the main risks they face. Ethan, Cathy, and his crew from QUEST Northwest did a fantastic job of documenting the plight of the endangered southern resident killer whales. They also produced the most amazing photographic thank you book ever seen (they *really* got Leslie’s number!). QUEST is an award-winning multimedia science and environment series created by KQED, San Francisco. We applaud their efforts to raise public awareness and science literacy. For those listeners, readers, and lookers who are inspired by these QUEST features: consider becoming a citizen scientist who helps us Listen for Whales using the live hydrophone streams at orcasound.net … One way to get started is by following Beam Reach’s step-by-step guide to listening for and recording orcas. Ethan also took the time to showcase the artwork of Odin Lonning which graces Val and Leslie’s guest house. 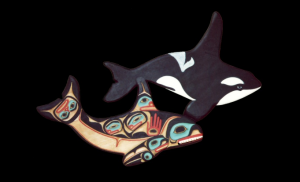 He wrote down the Tlingit story of Natsilane that Odin depicted in wood and paint in a piece called Why Killer Whales Don’t Eat People: Where Science and Legend Meet”. The piece parlays the artwork and legend into a discussion of orca-human interactions and relationships.